**** Chosen by Winner: Brian H.
The Perfect Tool for Gutting and Skinning. A collaboration between Glenn Klecker and David Kurt, a lifelong hunter and custom knife maker. This lightweight drop point, all around hunting knife is simple to pack but designed to get the big jobs done. The G-10 handle and thumb jimping are comfortable and have easy to grip finger notches that keep it in place, even when the cutting is wet and slippery. A full-size removable gut hook and bottle opener are concealed in the handle, perfect for gutting, skinning and popping the top off of a cold one. From skinning to quartering, the 3.97-inch fine edge blade is designed for smooth engagement and firm cutting. 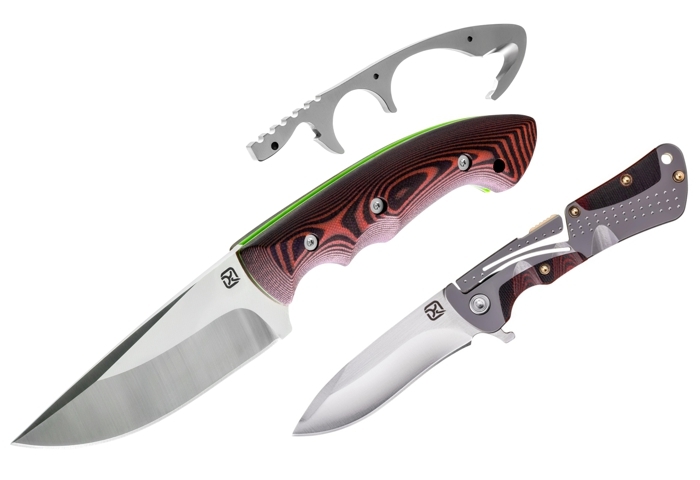 This stylish and rugged folder knife sports a 2.9" blade and is equipped with the patented Klecker Lock Mechanism – a lock-back in which the spring, lock-bar and detent are all integral to the frame structure. The handle features a handsome combination of gun-metal gray stainless steel and layered brown and black G-10 inserts complimented with polished brass accents. The reversible pocket clip is designed for tip up or tip down carry in a pocket, on a belt or in a bag.